The sport of 7 on 7 is just that. A sport. While I may not like that it represents year around football facts are facts; it is sweeping the Nation. For those planning to go after this sport you will have a wide variety of Coaches and Teams and clubs if you will after you. That is why for you and your parents you must select the best options out there. The NW is full of choices when it comes to these groups. One of them stands out above the rest and that is Ford Sports Performance. If there is a Gold Standard then this is it and folks it is not even close. This weekend in Hillsboro, Oregon FSP is holding an open try out for their teams in Oregon. Any athlete from Oregon or SW Washington looking to improve their skill set and to learn the 7 on 7 skill set will want to get to this program. 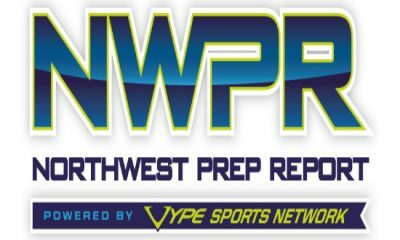 Out of these tryouts and some additional events in the Portland area FSP will select teams for 9th to 12th grade who will have the chance to compete in the region and around the country. Last year they were one of the top teams in the Nation and certainly the top groups from the NW. Tracy Ford has not and will never offer me a dime for an endorsement nor do I have any financial interest in his camps or events. Those that know me know I am critical of 7 on 7. Having said that I am willing to endorse someone like Tracy who is doing what he is doing . He has agreed to do what we have asked of him to insure that the kids are safe and keep a good perspective. All athletes competing will need to wear the certified Game Breaker helmets which are the only helmets designed to protect the athletes competing in this most certainly contact sport. In fact FSP is putting all the kids in the Gamebreaker Pro who has completed 3rd party testing and sought to be the best in the business. They are in fact the best- so the Gold Standard will be used at all FSP events. Your biggest risk competing in this sport is going to be concussion or catastrophic head trauma and brain injury. FSP gets a 10 in this category. Academic Requirements- FSP intends to require Academic minimums and has published this standard. The reason this is big is that 7 on 7 teams are famous for having amazing athletes who can not proceed to college. There is no point in competing in this fairly expensive sport if you are not able to advance in High School let along college. Here is one of FSP’s Academic requirement sheets from this Fall. 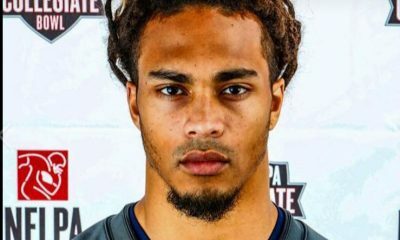 No Recruiting Of Athletes– This is a big one for me. 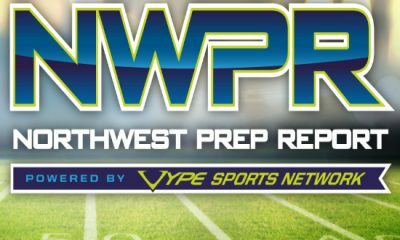 It turns out that these 7 on 7 teams ends up causing a large number of transfers from school to school as the boys and their parents make plans for making a run as team mates during the school year. I can name many athletes this season that moved in Oregon and Washington hoping to win a Championship or up their recruiting game. It does not work. Anyone orchestrating this or promoting this sort of thing at an FSP event will be asked to stop or leave the program. Tracy has given me his personal promise on this. No Pressure For Exclusivity- This is another big one. No one owns these athletes. But almost all of these kids are told by their coaches, trainers, or program directors that they are either in or out. We have had some kids tell us that their coaches and team organizers have told them not to go to camps or events that they are not involved with. Some have even told kids not to speak to me because I have been critical of them or 7 on 7. Parents listen if you want you kid to join a gang like group where the leaders dictate everything to your young person there are plenty of options in this 7 on 7 sport. FSP is committing up front not not do any of these activities. Proper Perspective– Each athlete will be advised of their skill set in an honest assessment. Tracy has promised to “keep it real” and to let athletes know if they are a college talent or not and where they best fit. This is mandatory from our side. 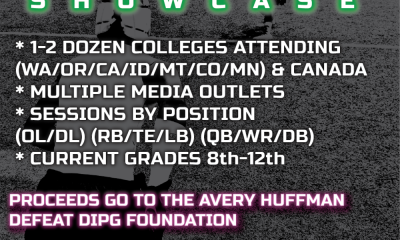 It goes without saying that we expect all of these things and will confirm that this is what is happening with any 7 on 7 group or event we attend or cover. We cover very very few of them. To remind you all we do not feel this is needed to be recruited to College nor will it help much. It will not hurt if it is done right and all things are kept in perspective. Having said that never attend a 7 on 7 event if you have a chance to work out in front of or with College Coaches. That and your academics have to remain top priorities. 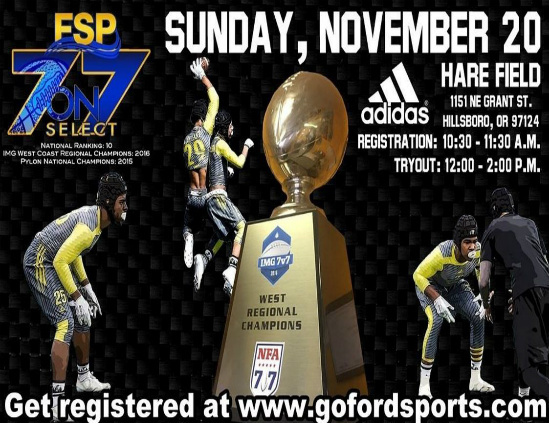 This Sunday at Hare Field in Hillsboro will be the FSP 7 on 7 Try outs- Registration Opens at 10:30 and Tryouts Start at 12 and last until 2 PM. Stay Safe- Have Fun- Go Gold!